I first became aware of Julie Marie Wade when I read When I Was Straight, published by A Midsummer Night’s Press, which I enjoyed tremendously. This volume, however, apparently preceded it and is being reprinted by Bywater Books, and I’m so happy to be able to give it a bit of a push. 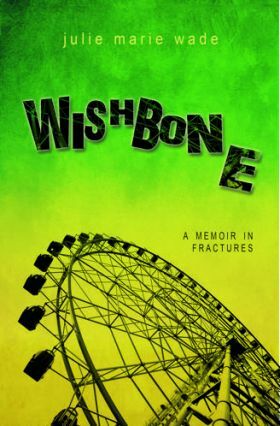 Wishbone is an absolutely absorbing memoir full of poetic prose, indelible imagery, and a fractured timeline that makes perfect sense despite its non-linear progression. Certainly, there are as many ways to recount a life as there are to live it, and none are more wrong or more right than others. Most writers opt for a chronological approach simply because it’s the easiest way to tell the story, involving far less work on their part as well as the part of the reader. The fragments of personality that Wade presents look haphazard at first, but as the book progresses, and we see more and more of them, the pattern becomes clear. It’s like a broken mirror whose pieces have been arranged into a semblance of its former self, regaining its shape the farther back one steps. If all this sounds like too much effort for a reader to make, it isn’t. The pieces are incredibly creative, with time and character shifts that confuse then dizzy at their verisimilitude once their purpose becomes clear. In “Dreaming in Alpha,” Wade rides the bus with her mother fifteen years before her birth, talking to her about life, love, and J.D. Salinger, and she meets her grandparents-yet-to-be in “Early Elegies,” dialoguing with a grandfather who died when she was but a child. But my favorite fragment–the one most fully realized in terms of creativity and relevance to the life in question–is unquestionably “Third Door,” which assumes the aspect of a game show featuring portions of her mother’s (and her) life. Her father is behind Door #1, Door #2 contains a lifelong friend who desperately wanted to be her mother’s husband, and Door #3 reveals her mother and a girlfriend of hers named Lara as they share a sweet kiss watching Marilyn Monroe in “The Misfits” in the balcony of a movie theatre. Touching, telling, and totally involving. Indeed, Wade’s mother is never far from the narrative, no matter when or how it’s being told. She’s in “A Life on Land,” contrasting Wade’s love of the water with her own fear of it (which also contains a harrowing, barely-missed gay bashing), “Black Fleece,” which sees the beginning of Wade’s thyroid problem, and “Carapace,” where Wade discovers the concept of death. The read is short (about 145 pages), but its length belies the punch it packs and the work that it accomplishes. It reminds me very much of Gregg Shapiro’s excellent Lincoln Avenue from last year, though the territories they mine are vastly different. Highly recommended!